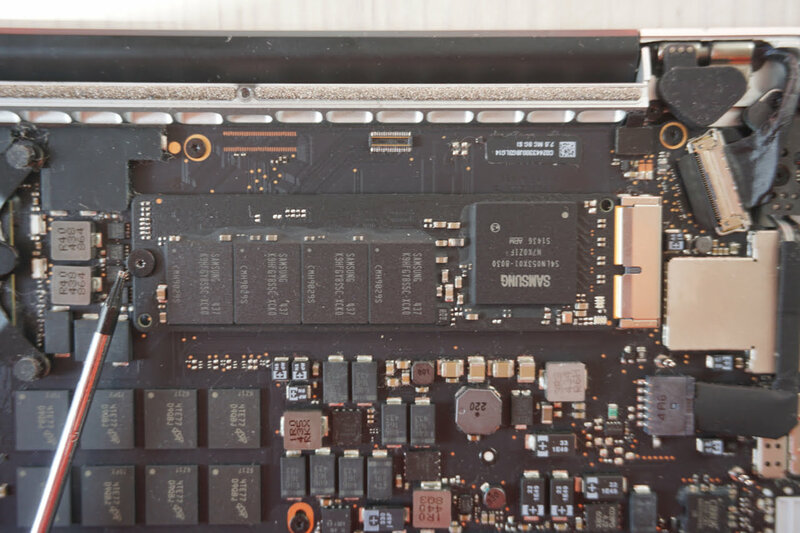 For older MacBooks it may be necessary to adjust the standby mode when using NVMe models, which can lead to a lower stand by time. There is also a little risk that you have to do some troubleshooting with individual configurations. 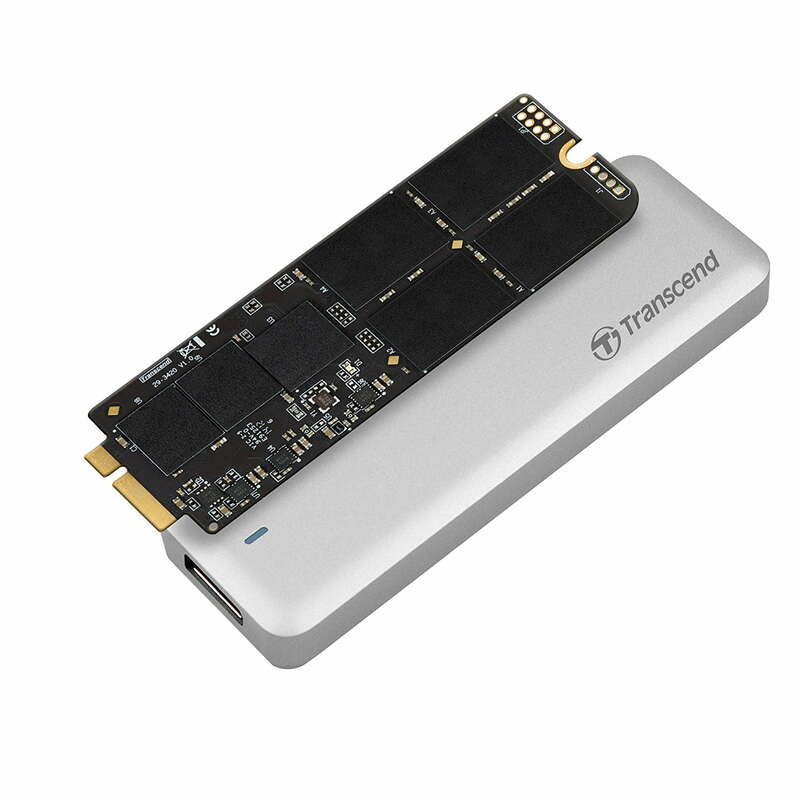 If you want a solution that works immediately, you should get a Transcend or OWC SSD. Suitable SSDs Model Number A1502 and A1398 and Model Identifier: MacBook Pro 11,1, 11,2, 11,3, 11,4, 11,5 and 12,1. 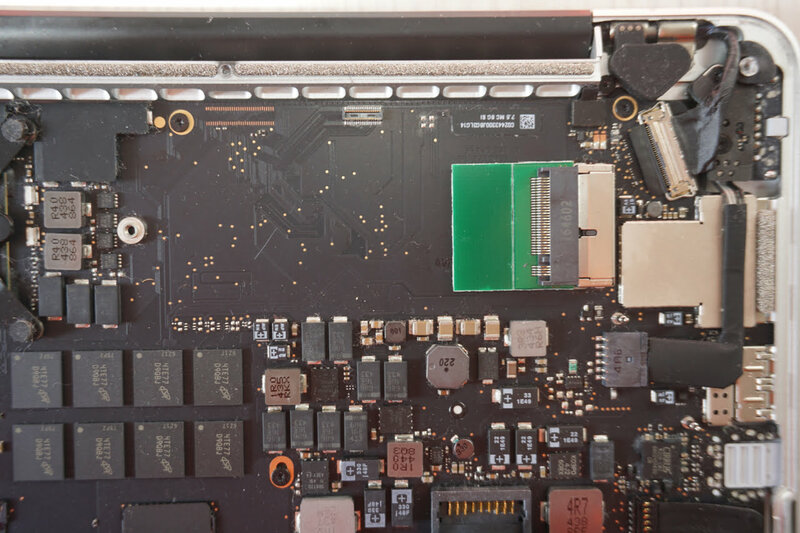 Under macOS High Sierra it is possible to use NVMe SSDs from other manufacturers (with the corresponding mechanical adapter). This has the advantage of high capacities at low prices. 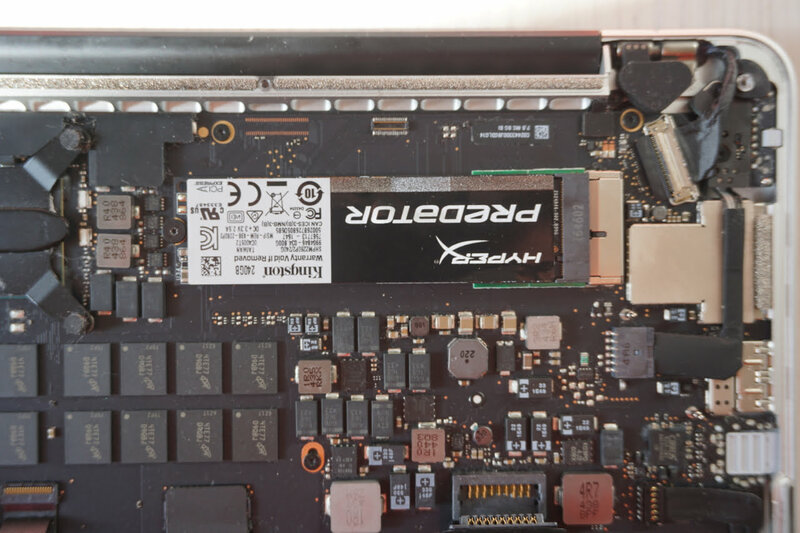 The 2015 models tolerate the SSDs without problems. For the 2013 and 2014 models, the standby mode must be adjusted. More details in the instructions below. Please pay attention to the 2013 model, whether it is one from the end of 2013 or from the beginning of 2013! 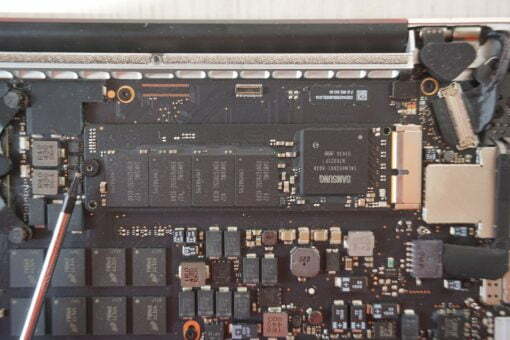 The early 2013s support SATA SSDs, then please refer to the table below. 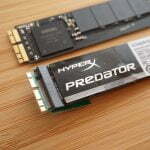 The 2013 model has a maximum speed of 700 MB/s, from 2014 on double and even higher. However, this speed can only be achieved with the adapter solution. 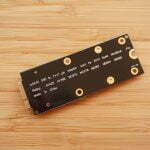 OWC and Transcend SSDs can only read 800 to 950 MB/s, write a little less. 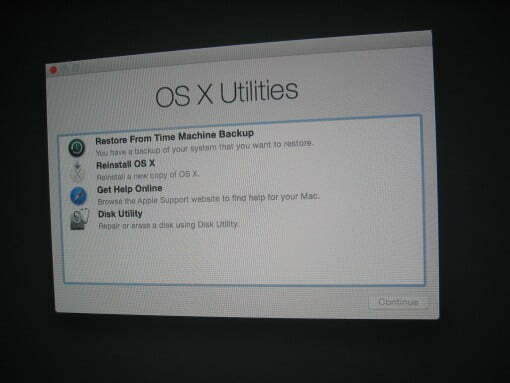 We mention it again: Users of 2013 models should check twice if they got an Early or a Late 2013 machine. The difference lies in the mechanical adapter necessary as well as in the type of SSD. 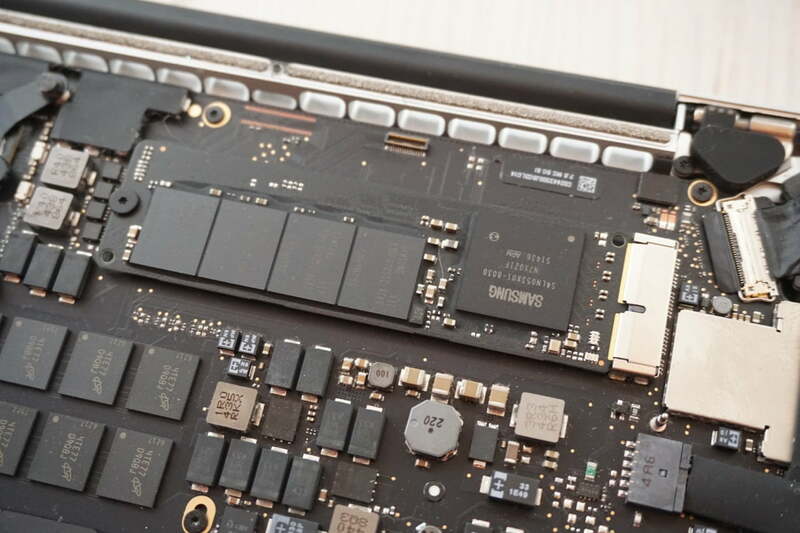 The situation is further complicated by Apple’s choice to make the SSDs in this model rather wide than long. 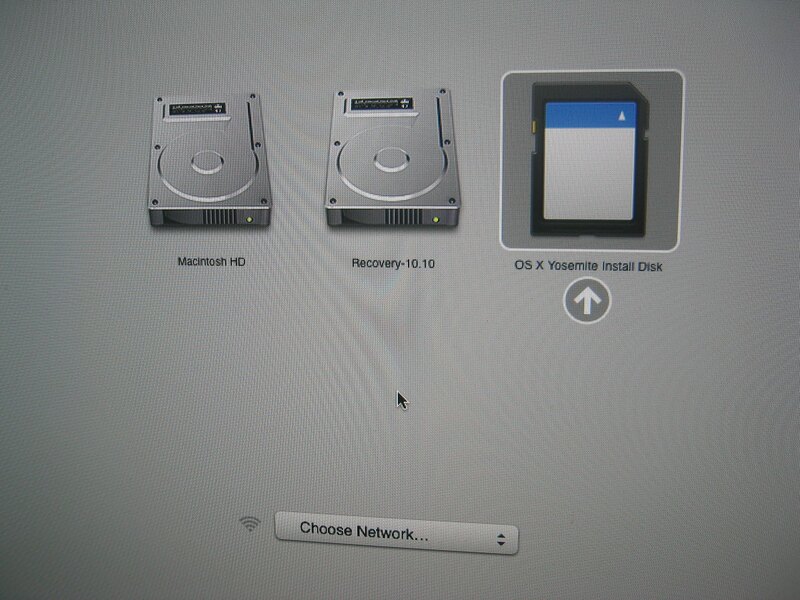 This gives you two options: You can use a M.2 to MacBook Pro 2012 adapter or a mSATA to MacBook Pro 2012 adapter. 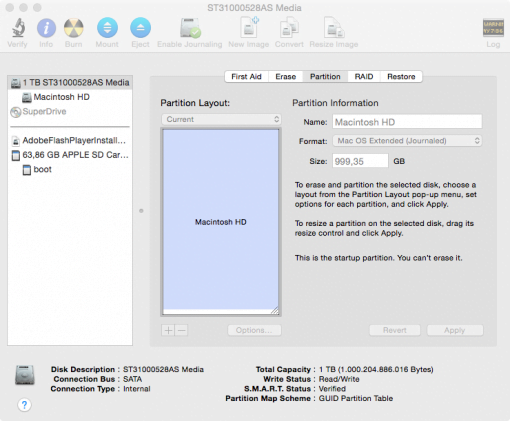 The speed delivered by matching SSDs is the same, as both base on SATA. The key difference is the maximal size of usable storage. 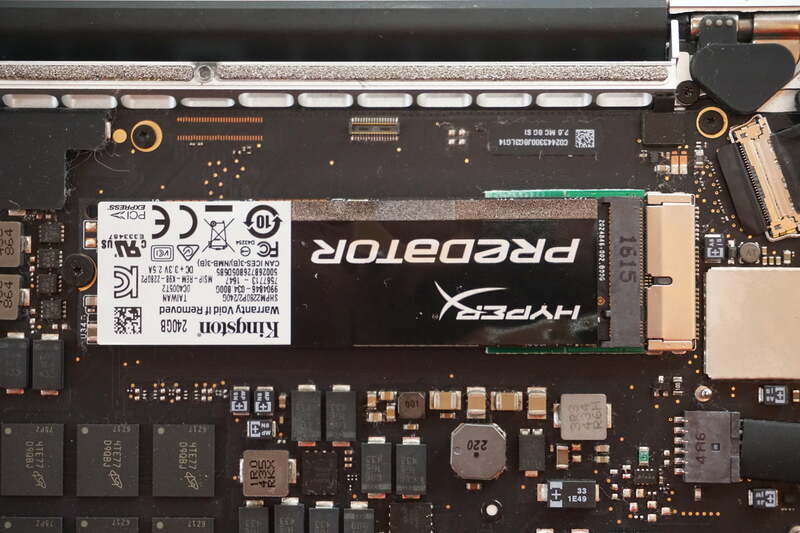 As M.2 SSDs are only allowed to be 60mm long in this case, the biggest available model is 500 GB. 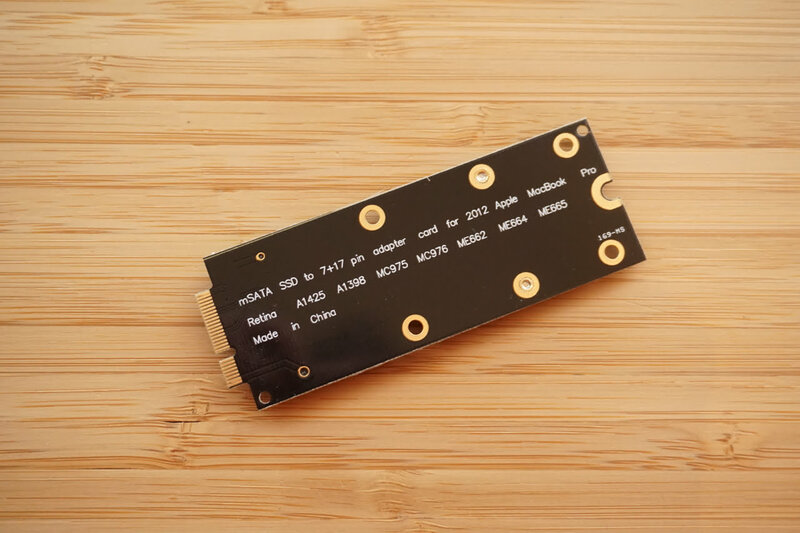 If you are searching for more capacity than that, you have to choose the mSATA adapter and a mSATA SSD. In the following tables you can find matching combinations. Again, solutions with adapters allow for a cost effective upgrade. Devices made by OWC and Transcend come without the need for an adapter piece, are therefore more expensive tough. If you decide to buy the Transcend JetDrive please notice that they differentiate between 13″ MacBook (JetDrive 720) and 15″ model (JetDrive 725). You want more memory, but you don’t want to use the screw driver? Then there’s a smart alternative for the MacBook Retina’s 13″ and 15″ SD card slot. 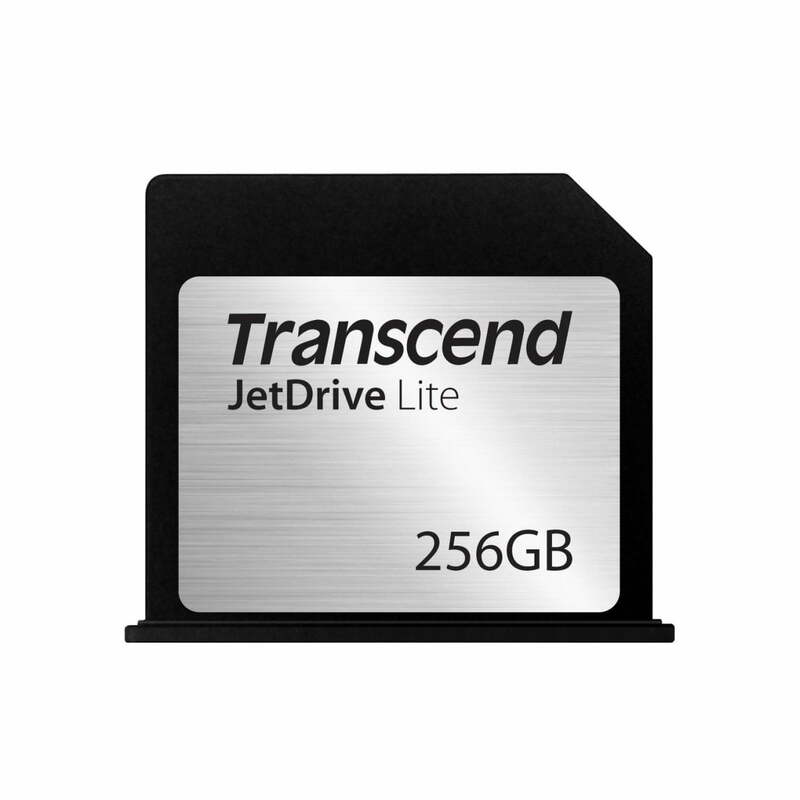 Transcend offers memory expansions that can easily be plugged into the slot for the SD card and still offer up to 95 MB/s speed. The expansion is available in 64, 128 and 256 GB capacity. If you want to save or have even more capacity (up to 400 GB current), you can also buy an adapter and the matching micro SD card separately. Then for 200 GB storage only pays around 60 dollars, for 400 GB as micro SD card you’ll pay around 160 dollars. 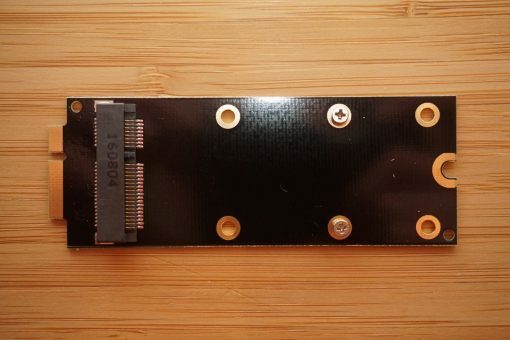 After you removed all the screws, just take the backplate off. you will now see the inner construction of the machine. The fist step to do is to disconnect the battery. 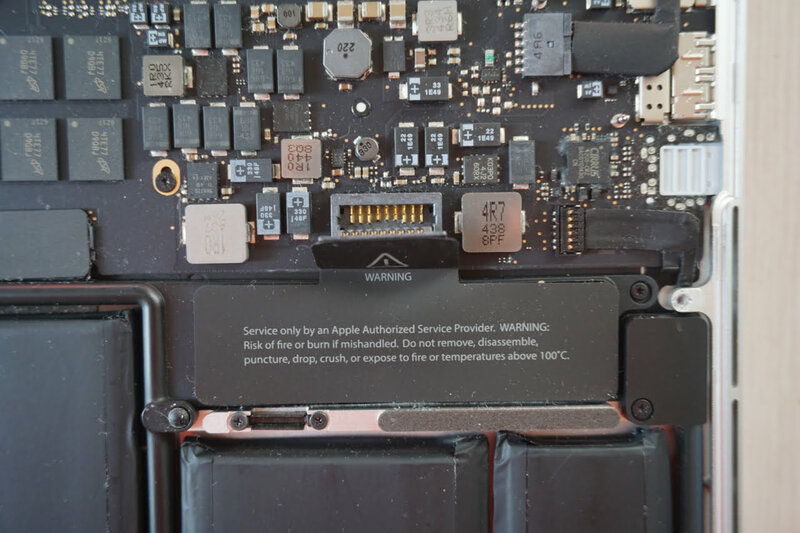 Pull up the connector on the right side and don’t get fooled by Apple’s warnings. 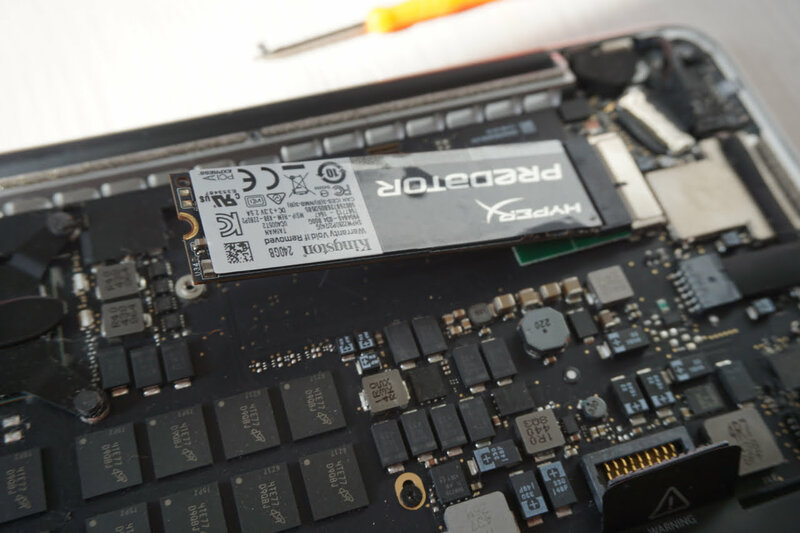 Replace your old SSD drive for the new one. The actual SSD change is more than simple: unscrew the one screw holding in the original SSD place. Now insert the new M.2 SSD under a 45 degree angle and push it down. The little gap at the end of the drive should fit perfectly over the screw’s socket. Refit the screw. Done! Don’t forget to reconnect the battery before you put the bottom plate back on again. Screw on the Pentalobe screws. They should go in easily and only at the end tighten. If they go in heavily, remove them and try to fit them with a bit of an angle. 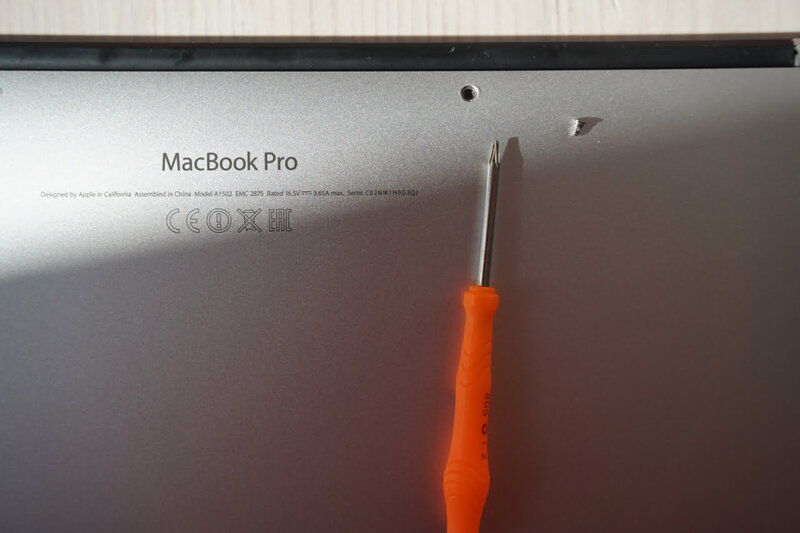 The pictures above show a MacBook Pro Retina 13″ Mid 2013 – 2015. If you own a 15″ model, you will find the SSD below the left fan. 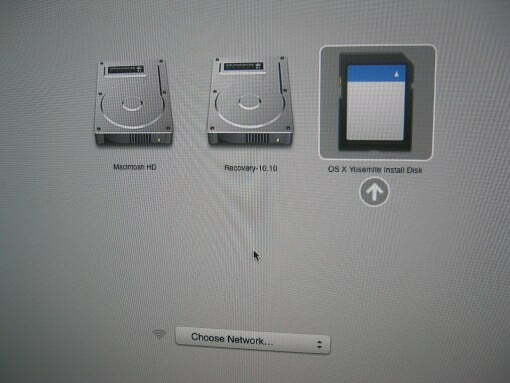 Als instructions are exactly the same though, as the SSD drive is identical. Thanks for such detailed information. 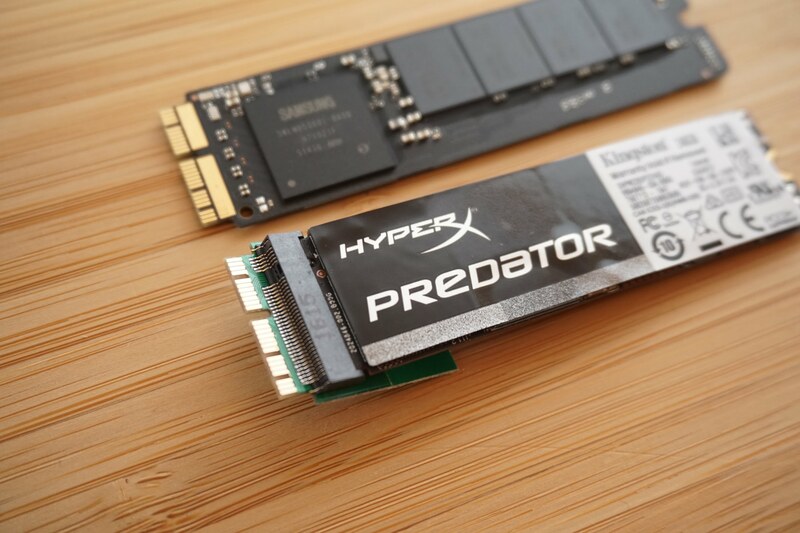 I am wondering if the later model Intel, WD and Samsung SSD card work the same? thanks for your kind words. Yes, these should also work as they are NVMe models. We haven’t tested them though. The Samsung might run a little hotter than others. But in the end, you should not run into more problems than with previous generations of these models. Let us know what your experiences are, when you have upgraded! Feel also free to post a few pics in our forum to share your experience! Thanks for your quick response. I have decided to give Western Digital Black 1T SSD card a try. Will share my experience once I have upgraded successfully. That sounds great, thank you! Much fun and success while upgrading! I finally got my Western Digital Black 1T SSD card installed. It runs perfectly with read/write speed at around 2,600 MB/s. Thanks again for your detailed information! great to hear! Thank you very much for your feedback, it helps a lot! Thanks for the tutorial . I would like to ask if is it possible to use m2 sata ssd instead of m2 nvme ssd on macbook pro 2015 early ? so far i couldnt find any adapter for it . thanks for your kind words. No, that is not possible. 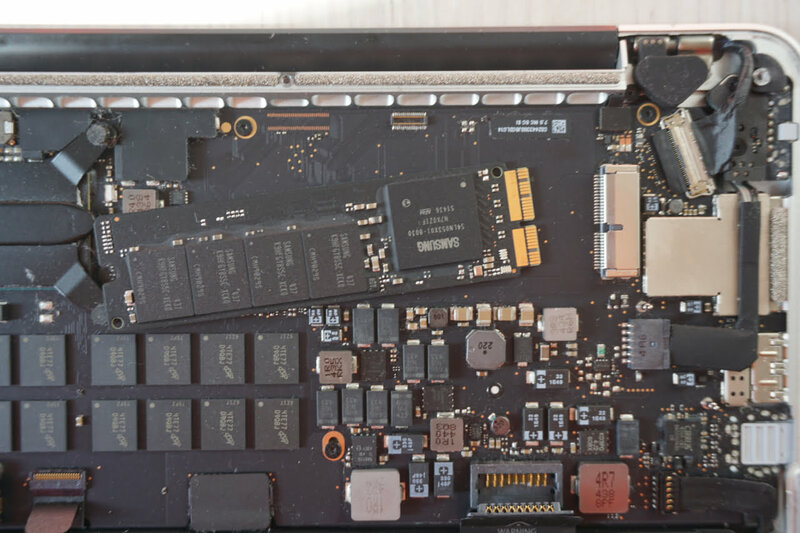 Although they might fit mechanically, the newer MacBooks use NVMe as a protocol for the SSD and therefore need such a model. Thanks,I will go for nvme ones then .